A couple of nice views of the work-in-progress bridges. 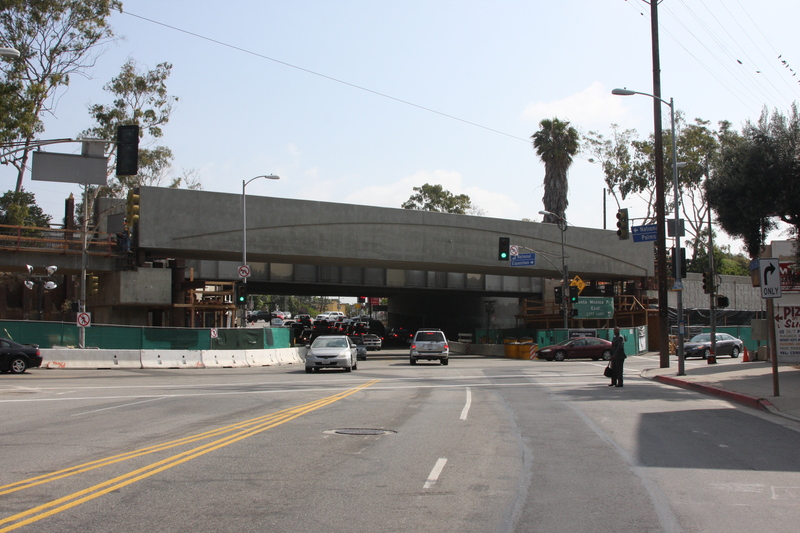 The top is the new bridge that will be adjacent to the Palms station. The bottom photo shows the bridge that will carry the Expo Line over Cloverfield and Olympic boulevards in Santa Monica. 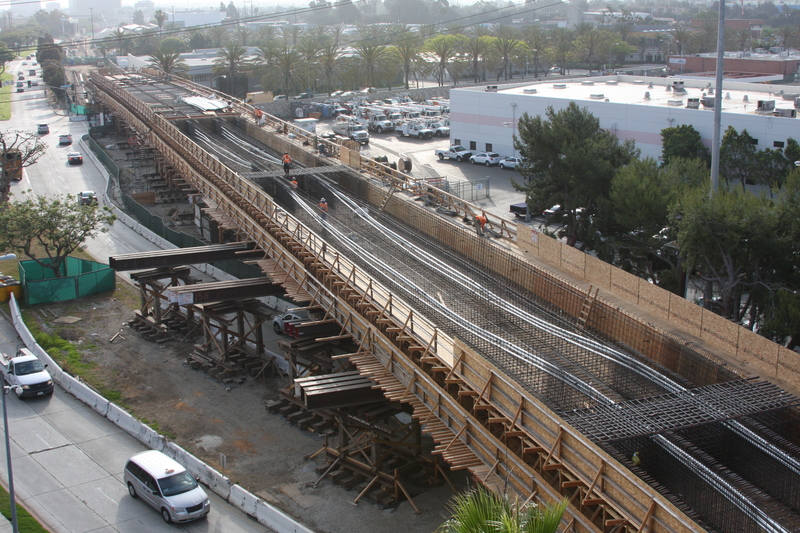 Check out more construction photos on Expo Line Fan’s Flickr stream. i cannot wait until it opens up!!! I love this new contractor. They’re building the bridges WAY faster than the last construction company did. The upper photo is National/Palms/Expo. Neither photo is in Santa Monica. Oops, you just fixed it. Nice pics. As long as they don’t have to worry about any meaningless “artwork” the bridges will get done, the stations will get done, and the “extension” might actually get DONE and OPENED in 2014, and NOT 2015! Is it just me, or does it seem like the Expo Line is being built MUCH faster than the Gold Line to Azusa?? These grade separations at major street intersections and crossing gates are key reasons why the light-rail lines outperform the Orange Line buses. This lack of separation from cross traffic limits the speed of the buses and therefore lowers the amount of passengers that the Orange Line corridor can carry. Its the design of the transit way that gives many of the perceived advantages of a train over a bus and not the technology of trains versus buses. Metro was willing to spend four and a half times more per mile to built the Expo Line Phase 1 than the original 14 mile Orange Line and 2.3 times more per mile than the 4 mile extension of this bus way–which includes two bridges over waterways and a bridge over the Metro Link tracks. Even with having to cross intersections at grade level, Metro anticipated that the Orange Line buses would take 28.8 to 41 minutes to complete the original 14 mile route. Instead, it took 40 to 50 minutes from end to end. This was due to the LADOT making them stop at several intersection and also the buses having to slow at all intersections to reduce the odds of collisions. When the LADOT traffic control headquarters looks at what the traffic is like at the intersections along the Orange Line corridor they are seeing how many boxes are being moved. They might see 40 cars at are only carrying one person each and one bus that is carrying 90 people. The cars would get the priority because there are more of those boxes than there are buses. The biggest limiting factor in the Orange Line is not the buses, but the cheap transit way design. The TransMilenio bus-rapid system in Bogota Columbia opened with 24.8 miles of bus way that carried 800,000 passengers a day. This was expanded to 34.1 miles. The system has a throughput of 34,000 passengers per direction per hour. Although TransMilenio uses double hinged buses and the Orange Line is limited to single hinged 60-foot buses, the Orange Line should not be starting to reach a maximum capacity at only 30,000 passengers a day when TransMilenio can handle 68,000 an hour. Most of the limitations of how many passengers the Orange Line can carry is mainly due to how it is operated and the bus way design and not the buses. There is less news about the Foothill Extension because most of its construction is sort of tucked away, while Expo’s progress is easier for everyone to see. Just because news outlets and blogs don’t talk about Foothill’s construction, that doesn’t mean nothing is going on that front.